Your local dog training club for Fleet, Church Crookham (Hart) and North Hampshire. Looking for friendly dog training classes in the evenings? 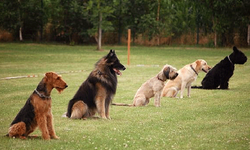 Like to join pet dog training classes with local people? Want to show your pedigree dog? Fleet and District Dog Training Society offer basic dog training (Obedience on Wednesdays) and show ring training (Ringcraft, on Tuesdays). Our instructors are experienced people, who offer sympathetic and kind training methods, encouraging members to achieve as much with their dogs as they wish. 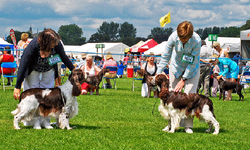 Learn to handle your dog for the show ring with experienced trainers. Lots of tips from experienced handlers too! Forge a strong bond with your dog, for a more fulfilling and rewarding relationship. Three levels of classes, one night of dog training fun! Our course dates for dog training classes and ringcraft classes in 2018.